The pension fund’s request for $4.8 billion in taxpayer contributions for the next budget year, a 10 percent increase from the previous year, highlights the need for pension reform in Illinois. The Teachers’ Retirement System, or TRS, says it needs an extra $400 million from taxpayers in next year’s state budget, according to the State Journal-Register. That’s a 10 percent hike from the previous budget year, bringing the total taxpayer contribution to $4.8 billion. With pension contributions already consuming more than 25 percent of the state’s general revenue, this request should alert lawmakers to the need for comprehensive statewide pension reform. 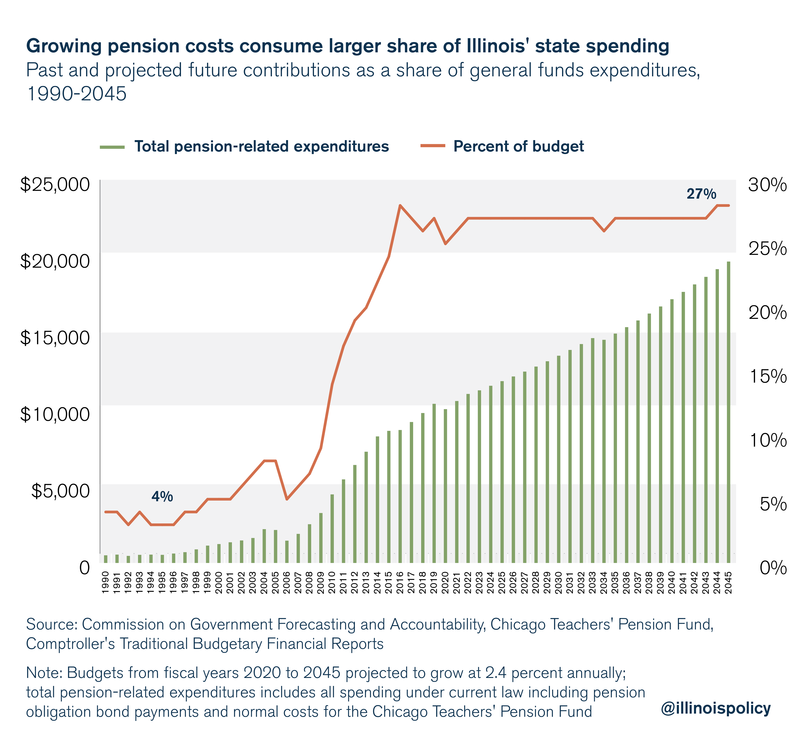 Rapidly increasing pension contributions are crowding out core government services, such as education and public safety, and causing some to call for tax hikes despite Illinois’ already high tax burden. Absent reform, this problem will continue for decades to come and likely grow worse. 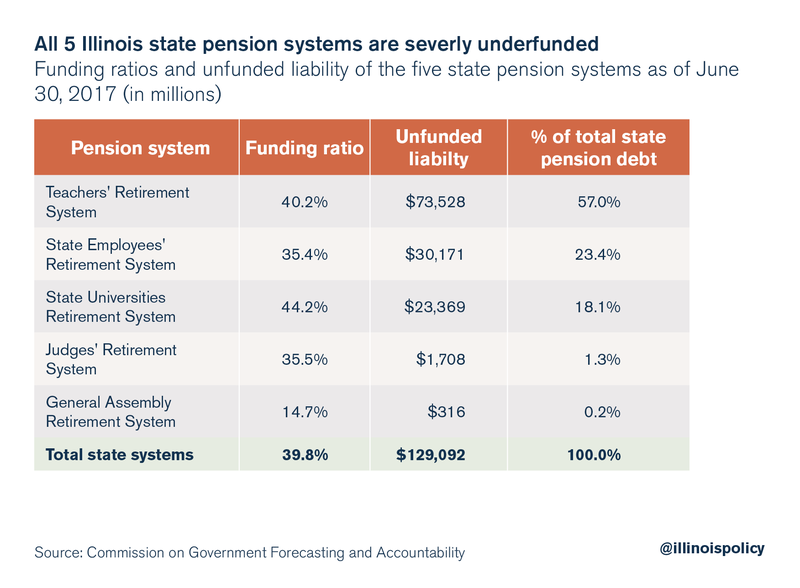 TRS accounts for the largest portion of Illinois’ $130 billion unfunded pension liability, according to the state’s official numbers, at over $73 billion. While local school districts are responsible for negotiating teacher salaries and benefits, which form the basis for pension benefits, state government – which means every taxpayer statewide – currently pays for the employer share of teachers’ pensions. This creates a misalignment in incentives because school districts do not have to pay the full, long-term costs of their salary and benefit decisions, which reduces pressure on local officials to keep costs down. Gov. Bruce Rauner’s fiscal year 2019 budget request had proposed realigning the costs of government retiree health insurance and pension costs for schools and universities to fulfill a simple principle: The one who incurs the cost should pay the bill. 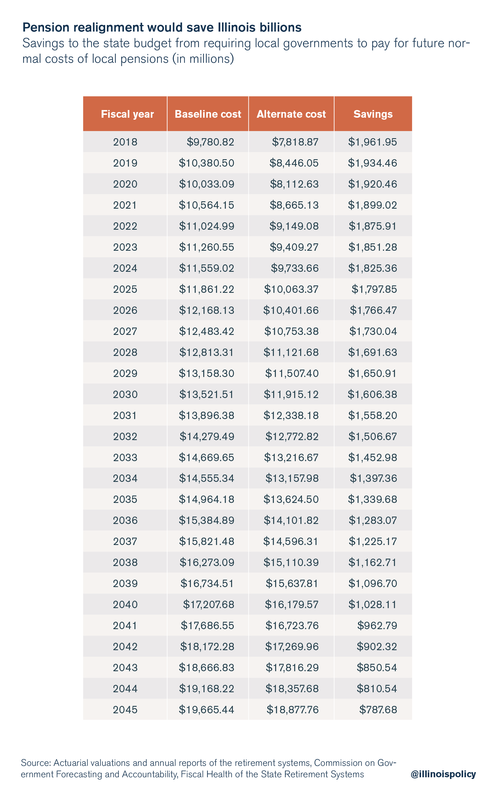 Rauner’s gradual four-year phase-in of the realignment would have saved $825 million in the first year alone. A total realignment of the costs of local pensions would net significant savings for the state, reducing pension-related expenditures by nearly $2 billion a year for the next several years. Realigning the costs of pensions should be coupled with reforms to reduce property taxes and allow local cost savings, so local officials can balance their budgets without having to ask homeowners to pick up the difference. Properly aligning responsibility for pension payments with decisions about salary and benefits can deliver immediate relief to state taxpayers and curb the growth in teacher pensions going forward. But ultimately, creating a sustainable and affordable government worker retirement system will require meaningful pension reform to reduce the size of the liability. Lasting pension reform should start with a constitutional amendment to allow changes in future, unearned benefit accruals and end with moving all new hires into personal retirement accounts that get politicians out of the business of managing retirement savings.